Keeping beauty at the heart of all that we do, Dove brings to you the ultimate festive indulgence this season – Dove Elixir. Plucked from the gardens of ancient beauty regimes, this is a range of precious hair oils that make oiling the mane a pleasurable and convenient experience. An ode to everything beautiful, the golden drops of Dove Elixir help retain moisture and lend your tresses a magical luminosity. Indulge your senses this festive season with the aromatic essence of real ingredients like blooming roses, playful lavenders and wild hibiscus infused with almond, olive and argan oil for optimum efficacy. Treat yourself with the enriched experience of hair oiling with Dove Elixir that provides the power of overnight oiling in just 30 minutes! Hair fall Rescue: The sacred flora of Greek Goddess Aphrodite or the object of the great philosopher, Confucius’s renowned study – the rose; now lends itself beautifully to Dove Elixir. Rose with almond oil known to be available in far Southern parts of Asia make for the virtuous concoction – Hair Fall Rescue by Dove Elixir. These golden drops of Dove Elixir Hair Fall** Rescue breathe life into the fragile hair that fall easily, help nourish and help protect hair from damage. The potion of Dove Elixir Hair Fall** Rescue will help reduce hair breakage, to give you the power of overnight oiling* in 30 minutes. Almond: Give your crowning glory oodles of style, appeal and nourishment with the richness of almond oil. Dryness Care: Lavender and olive oil: Used in Egyptian medicine from 1800 B.C. and often used by Greek pharaohs for fragrance, Lavender or Lavendula, now lends itself beautifully to Dove Elixir. Lavender with rich olive oil that is known to be found in abundance in the Mediterranean region, make for the virtuous concoction – Dryness care by Dove Elixir. These golden drops of Dove Elixir work to help repair signs of dryness help nourish every single hair fiber and help protect against damage. The potion of Dove Elixir – Dryness Care will give luxuriously soft, beautiful tresses, to give you the power of overnight oiling in 30 minutes. Olive: Olive oil provides lustre and shine to your mane and keeps your hair looking beautiful. Daily Shine: Hibiscus and Argan Oil: Known for its healing properties from the Middle ages or worn behind the left ear to attract her desired lover, legends about the famed hibiscus are as many as its qualities and it now lends itself beautifully to Dove Elixir. Hibiscus with the Argan Oil that’s known to be found in Morocco, make for the virtuous concoction – Nourished shine by Dove Elixir, These golden drops of Dove Elixir work to help hair retain moisture and lend it a magical luminosity. The potion of Dove – Elixir Nourished Shine will give you brilliantly luminous tresses, to give you the power of overnight oiling* in 30 minutes. Argan: Popularly called as liquid gold, Argan gives new life to dry, tangled hair and adds shine and luster. Quick application- In order to have soft and nourished hair, apply the hair oil just before cleansing. Thats not all. 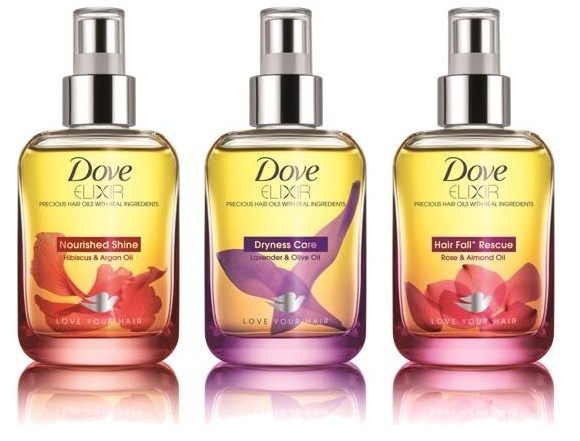 You can also use Dove Elixir as a post wash serum, before hair styling -blow dry, hair ironing. This way you ensure you’ve got added moisture, increased shine and easy to manage hair.